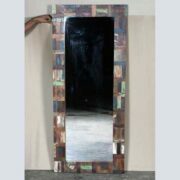 Large wall mounted mirror intricately made using recycled materials in Jodhpur, Rajasthan . 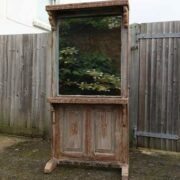 We’ve had shipments of this style of mirror in the past but never this large! This new shipment are fantastic. 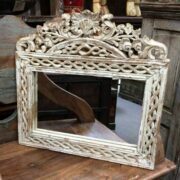 Intricately manufactured using many small, angled pieces of reclaimed timber to make a circular, sun shaped frame, these mirrors are exceptionally eye-catching. 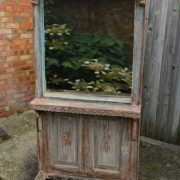 Each piece of reclaimed timber has its own finish or colouring and the combination of many creates a multi-coloured finish that combines wood grain with distressed blues, greens, oranges and more. Perfect for a living room, dining room or hallway, these mirrors can easily be mounted onto a wall and are not as heavy as they may seem.